The terminal velocity of a falling body occurs during free fall when a falling body experiences zero acceleration. This is because of the retarding force known as air resistance. Air resistance exists because air molecules collide into a falling body creating an upward force opposite gravity. This upward force will eventually balance the falling body's weight. It will continue to fall at constant velocity known as the terminal velocity. Source: Tom Henderson. Skydiving. Glenbrook South High School. The magnitude of terminal velocity depends on the weight of the falling body. For a heavy object, the terminal velocity is generally greater than a light object. This is because air resistance is proportional to the falling body's velocity squared. For an object to experience terminal velocity, air resistance must balance weight. An example that shows this phenomenon was the classic illustration of a rock and a feather being dropped simultaneously. In a vacuum with zero air resistance, these two objects will experience the same acceleration. But on the earth this is not true. Air resistance will equal weight more quickly for the feather than it would for the rock. Thus the rock would accelerate longer and experience a terminal velocity greater than the feather. Another factor that affects terminal velocity is the orientation at which a body falls. If an object falls with a larger surface area perpendicular to the direction of motion it will experience a greater force and a smaller terminal velocity. On the other hand, if the object fell with a smaller surface area perpendicular to the direction of motion, it will experience a smaller force and a greater terminal velocity. The terminal velocity for a skydiver was found to be in a range from 53 m/s to 76 m/s. Four out of five sources stated a value between 53 m/s and 56 m/s. Principles of Physics stated a value of 76 m/s. This value differed significantly from the others. Then again, the value is variable since the weight and the orientation of the falling body play significant roles in determining terminal velocity. Terminal velocity is often reported to be approximately 60 m/s for a typical skydiver in free fall. Exceptional skydivers are able to increase this value considerably by diving head first with their arms against the sides of their bodies, legs held firmly together, and toes pointed. This posture presents a minimal projected area perpendicular to the direction of motion thus reducing aerodynamic drag. Special helmets and slick body suits reduce drag even further. On 16 August 1960, US Air Force Captain Joseph Kittinger entered the record books when he stepped from the gondola of a helium balloon floating at an altitude of 31,330 m (102,800 feet) and took the longest skydive in history. As of the writing of this supplement 39 years later, his record remains unbroken. The air is so thin at this altitude that it would make for a moderate laboratory vacuum on the surface of the earth. With little atmosphere, the sky is essentially black and the sun's radiation is unusually intense despite polar temperatures. Sitting in my gondola, which gently twisted with the balloon's slow turnings, I had begun to sweat lightly, though the temperature read 36 degrees below zero Fahrenheit. Sunlight burned in on me under the edge of an aluminized antiglare curtain and through the gondola's open door. The density of air at 30 km is roughly 1.5 % that at sea level and thus drag is essentially negligible. No wind whistles or billows my clothing. I have absolutely no sensation of the increasing speed with which I fall. [The clouds] rushed up so chillingly that I had to remind myself they were vapor and not solid. This is not true for skydivers at ordinary altitudes, which is why they reach terminal velocity and cease to accelerate. According to Captain Kittinger's 1960 report in National Geographic, he was in free fall from 102,800 to 96,000 feet and then experienced no noticeable change in acceleration for an additional 6,000 feet despite having deployed his stabilization chute. 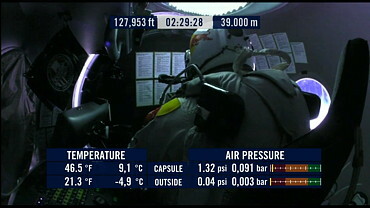 This gave him an unprecedented 3900 m (12,800 feet) over which to accelerate. At such extreme altitudes the acceleration due to gravity is not the standard 9.81 m/s2, but the slightly lower value of 9.72 m/s2. Using these numbers, it is possible to calculate the maximum theoretical velocity experienced during this record-setting jump. The result is amazingly close to the value recorded in National Geographic. As one would expect the actual value is slightly less than the theoretical value. This agrees with the notion of a small, but still non-zero, amount of drag. At nine-tenths the speed of sound, Captain Kittinger also holds the record for the greatest speed attained by a human without the use of an engine. The standard value of the speed of sound in air at 31,000 m is 300 m/s (670 mph). Given this, why then do so many sources report that Kittinger exceeded the speed of sound? One possible answer comes from the relatively obvious similarity between Kittinger's self-reported value of 614 mph and the most frequently misreported value of 714 mph (319 m/s). Somebody must have heard 614 but entered 714 accidentally into some officious document (like an encyclopedia). Some other people read the error and then reported it as fact. Many more people read these "facts" and suddenly nearly everyone was remembering the day Captain Kittinger broke the sound barrier. Another factoid is born. In the same way that science fiction humanoids appear human but are alien, real life factoids appear factual but are false. A factoid is a statement reported as truth that has, in fact, never been verified. Factoids are the scientific research of "they". "They say that cell phones cause brain cancer." "They say that margarine is better for you than butter." "They say that toilets spin the other way around in Australia." "They say that cows produce more milk when they listen to classical music than when they listen to rock and roll." At least, that's the way I see it. In a fantastic irony, people have started using the word factoid to mean a fact that can be stated briefly. I would call that a "factette". In the same way that a cigarette is a small cigar, a factette is a small fact. The definition of factoid is itself becoming a factoid. Captain Kittinger most likely did not exceed the speed of sound on 16 August 1960. To do so would have required an additional 1,300 m (4,200 feet) of free fall. That's a pretty large distance. I think he would have noticed it. This in no way detracts from his truly amazing accomplishment. A variation of this analysis appears in the chapter on falling bodies in the companion textbook on this website. An uncredited, but obviously paraphrased version of this analysis appears at the end of this essay at aerospaceweb.com. Frequently Asked Questions. stratoquest.com "Q: How fast will Cheryl [Stearns] go in freefall? A: Max. Speed is estimated @ 885 (1.3 mach) dependant [sic] on temp. density and weight." "Q: Will Cheryl [Stearns] break the sound barrier? "Mission: A record-setting, high-altitude skydive from 130,000 feet dedicated to scientific research, education and space exploration." "Records: First human to exceed the speed of sound without a vehicle. Break the 1960 world skydive record of 102,800 feet." Two skydivers intend to break Joseph Kittinger's 1960 world record parachute jump: Cheryl Stearns of the United States and Rodd Millner of Australia. Stearns is scheduled to jump over New Mexico in October 2001. Millner is planning his jump over Alice Springs in March 2002. Both skydivers plan to jump from an altitude of 40 km (130,000 feet) -- 8 km (5 miles) higher than Captain Kittinger. With this additional distance, it is quite possible that one of these jumpers will exceed the speed of sound. If we assume an average acceleration of 9.70 m/s2, it is a simple matter to determine the altitude at which a skydiver starting at 40 km would break the sound barrier. That's an altitude of about 116,000 feet. Keeping in mind that Captain Kittinger claimed not to sense any appreciable loss of acceleration until reaching 90,000 feet (27,430 m) it is now possible to project the next world record skydiving speed. It is doubtful that Stearns or Millner would actually reach anything near this speed, which is nearly 200 m/s faster than the local speed of sound. At the incredible speeds we're dealing with, air resistance can not be ignored. Stearns' prediction of Mach 1.3 seems very reasonable compared to my prediction of Mach 1.6. Add Michel Fournier, Steve Truglia, and Felix Baumgartner to the list of those going after Joseph Kittinger's record. 2002 "Our current window and location for project launch ... is September 2003, Fort McConnell Air Force Base, Wichita Kansas -- 'Centennial of Flight Airshow'." "After 12 years of efforts, Michel Fournier and his partners have still to be a little bit patient, and wait until beginning of May 2003 to see the Super Jump finally happen [over Saskatchewan]." 2003 "An unforeseen development forces the postponement of Michel Fournier's scheduled second attempt to carry out his stratospheric jump [over Saskatchewan].... until the end of August ." 2003 "UPDATE: Three intense training sessions will take place prior to the StratoQuest Launch in October 2004." "5th of August 2003 09:00. At 7 am, the balloon, still fixed to the truck, slowly filled with helium. During the release process, the balloon ripped at the top.... The 2003 Big Jump attempt failed." 2004 "130,000ft StratoQuest Launch: September 2005"
2005 "I have determined that it is not feasible for me to safely jump from that high an altitude at this time." "Michel Fournier was a victim of a financial swindle by a pseudo sponsor who carried out a false credit transfer on the bank of the Great Jump." 2007 "In August 2007 … Michel Fournier will drop out of the stratosphere from an altitude from about 130,000 feet (40 kilometers, nearly 25 miles) above the plains of Saskatchewan, Canada"
2008 "Using a narrow weather window starting May 25,  Michel will ascend in a pressurized capsule, harnessed to a 161-metre helium balloon, rising to the edge of space." WebWire "Steve Truglia will attempt to set a new World High Altitude Parachute Record this Summer by parachuting from the edge of space, 120,000 feet (or over 23 miles high)." 2009 "We are still in progress in testing the equipment and the budget is not yet finalized. As a result, we are postponing the jump for the spring of 2010." "Space Jump project is in the final stages of preparation. Sponsors are required to complete this exciting project." 2009 "The jump will take place within the next MTO window if I complete my budget." 2011 "Cheryl is working on sponsorship for StratoQuest. Updates to her project will be posted on this web site." "Unfortunately, the Big Jump will not take place in August for two reasons : -	My budget is not complete and, -	I will not be able to have my balloon in Canada before September 15th, there for the MTO window will be closed" "The legal action filed by Daniel Hogan and PerDan, LLC … has been mutually resolved by the parties out of court and the lawsuit has been dismissed." Alan Eustace and the Paragon StratEx Team make stratospheric exploration history at over 135,000 feet. Paragon Space Development Corporation, 2015. "On April 14, 2015 the Fédération Aéronautique Internationale, FAI — The World Air Sports Federation released the official parachuting world record breaking numbers. Supersonic Jump. Andreas Müller. The Physics Teacher. Vol. 51 No. 14 (January 2013): 14–15.